Today I've been playing with Diamine Citrus Ice, another ink from the 2017 Diamine Shimmertastics collection. I purchased my sample of ink from Vanness Pens. Citrus Ice is a bright yellow-orange with silver shimmer. I love the silver shimmer with this ink-it's a bit more of a subtle combo than some of the other simmer inks I have seen, which really appeals to me. Other properties: Medium shading, no sheen, and silver shimmer. On 20 pound copy paper, the ink did great-no problems. Ink swabs for comparison, left to right (top to bottom for mobile RSS): Diamine Golden Sands, Diamine Citrus Ice, and Diamine Inferno Orange. Click here to see the Diamine inks together (the Shimmertastics are at the bottom of the page). 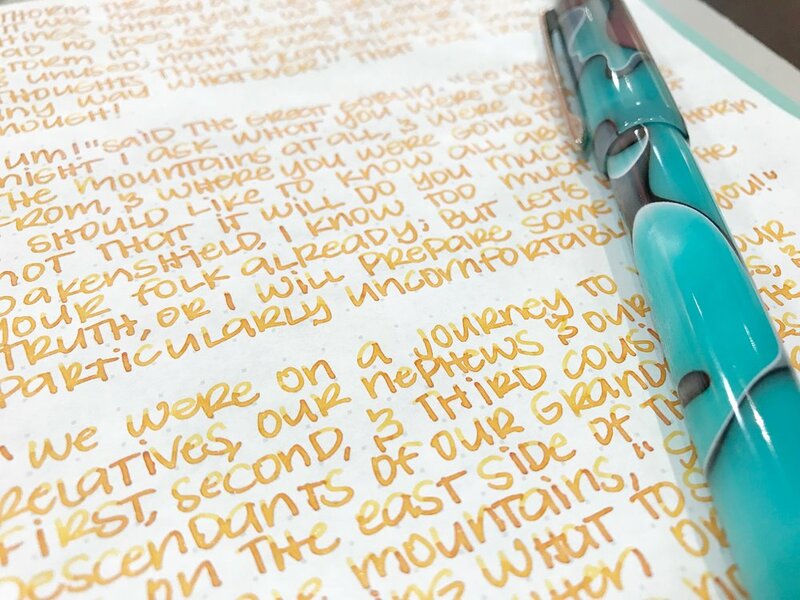 Diamine Golden Honey, Robert Oster Peach, and Papier Plume Sazerac. Click here to see the orange inks together. Peach feels the closest to Citrus Ice, without the shimmer of course. I used a medium Edison Nouveau Premier Seaglass on Tomoe River paper. The ink felt a bit dry to me. It wasn't unusably dry or anything, just slightly drier than average. Overall, I love the color-it feels like a shimmer version of Robert Oster Peach, which is an ink I love, but it is on the drier side. If Citrus Ice was just a bit wetter I would be in love with it, so for now I'll just use it in wetter pens. If Robert Oster ever came out with a silver shimmer version of Peach, I would be all over that. If you don't love shimmer but you like the color, give Peach a shot-it's a great non-shimmer option of this color.